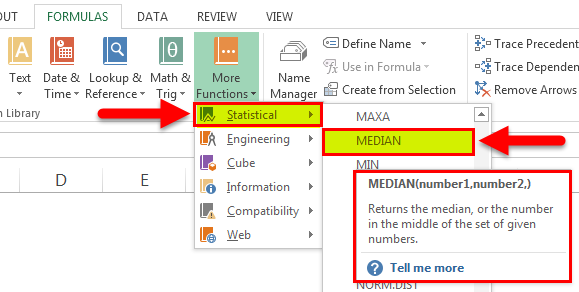 Median Function in Excel (Formula, Examples) | How to use Median? The values supplied as arguments do not need to be sorted in any particular in order for the function to work. Number 1 (required argument) – The number arguments are a set of single or more numeric values (or arrays of numeric values), for which you want to calculate the median. Select the Formulas tab & Click On More Function. 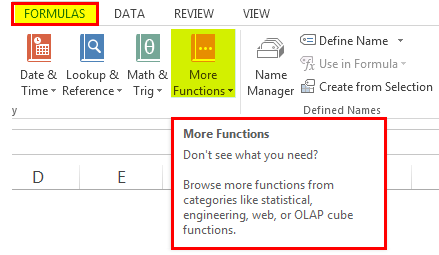 Choose Statistical to open the Function drop-down list. 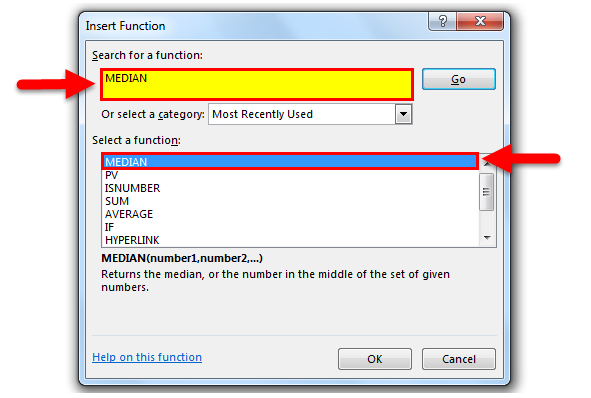 Select MEDIAN in the list. Also, click on Insert function icon then manually write Median and search the formula. We get new function windows shown in the below-mentioned picture. Then we have to enter the details. 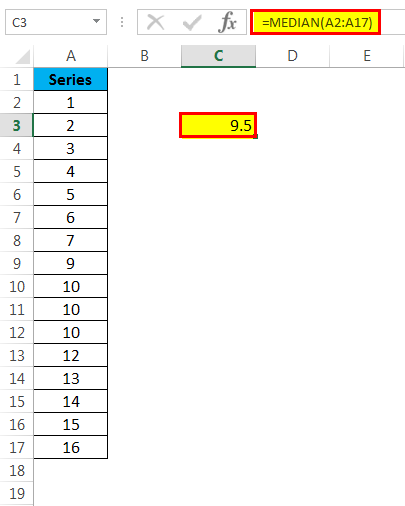 Put the Numbers value or Range value where you want to get the middle value of series. 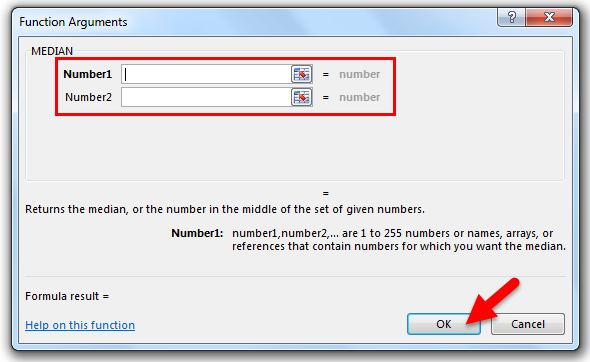 Then Click On OK.
Click on the cell where you want the result from the value then put the formula as below mentioned. 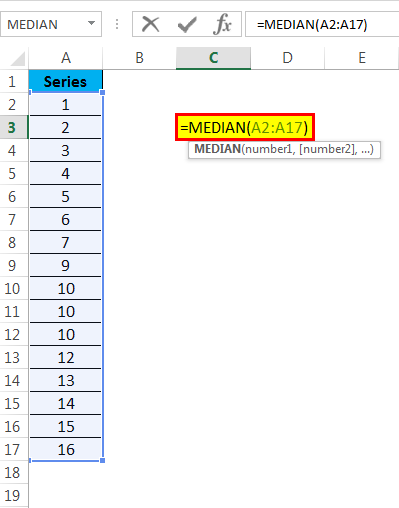 How to Use Median Function in Excel? 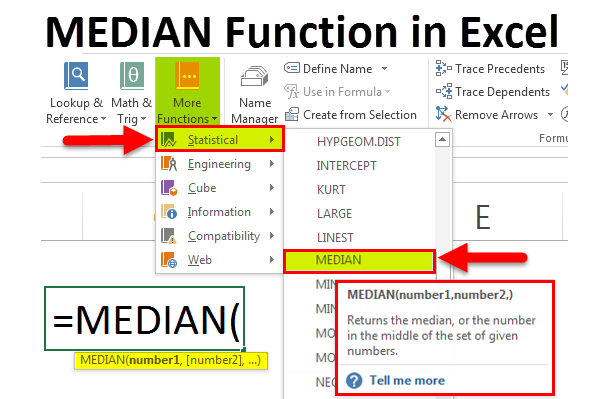 Median function in excel is very simple and easy compared to other functions in Microsoft Excel which contains lots of arguments or parameters. Example # 1 -Median function on even numbers. 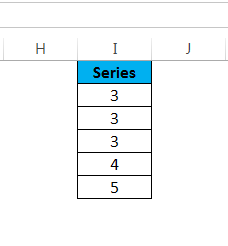 Let’s understand, below mentioned table and data as a series of even numbers, now I want to know middle no of the series, we can see that this is an even series of the set. So, on even numbers of the group, median functions pick the two middle numbers of value and get the average. So in this series, two middle numbers of the set are 10 and 9, thus if we get an average of 10 and 9 ( 10 + 9 ) / 2 then we get 9.5. Thus we can use the median function on numbers of all set to get the result. As shown in example one, this is the same table, only remove one number for creating the odd numbers of the group. So if we use the median function on an odd number of the set then simply find the middle numbers of value in series and we get the result. For example, we can see that 9 is the exact middle value of the group. There are two concepts of median function which is odd numbers of the set and even numbers of the set. If the data series in odd numbers. 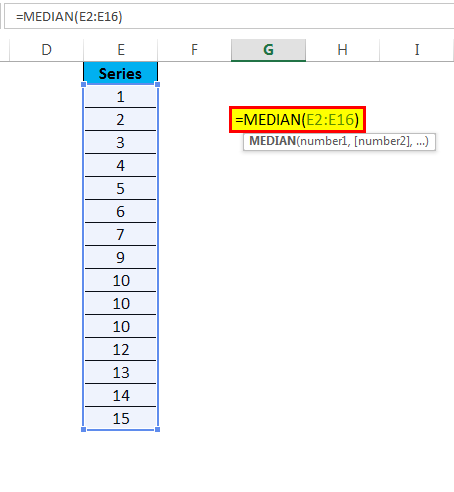 The MEDIAN function in Excel finds the middle of a number set or series, this result value is the middle in a group of numbers when those numbers are listed in numerical order. If the data contains an even number of value. The median then is the average of the middle two numbers in the group – when sorted numerically. If we talk about the data type which can be numbers, dates, named ranges, dates, arrays, or references to cells containing digits. Number1 is required, subsequent numbers are optional. Basically, as we know the median function and average function are approximately the same but there is some difference between both the formulas. Let’s understand the mathematical logic. In the below-given example, we will find the difference between average and median function by the following set of series. We can see that when we are using the median function for getting the middle number in a set of numbers listed in numeric order, as mentioned above, that as per odd numbers, any mathematical calculation of series finally gets the result exactly in the middle value of set as 3. When we are using the average function the numbers are added or the sum of the total set and then their total no of the count is divided. So the sum of the series is 18 and total no of the count is 5 then 18 / 5 = 3.6 is average of the series. The arguments can contain numbers, cell references, formulas, and other functions or it’s Maybe 1 to 255 arguments (Like number 1, Number 2, Number 3, Etc.) of Median function which is below mention. This function is applicable in only numeric value and dates, it will not work on any type of text value. Arguments that are text or error values and which cannot be translated into numbers cause errors. 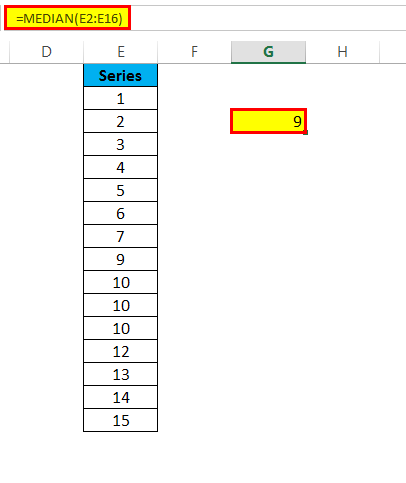 If there is an odd number of values in the dataset, the function of exactly the middle numbers of the set is returned. 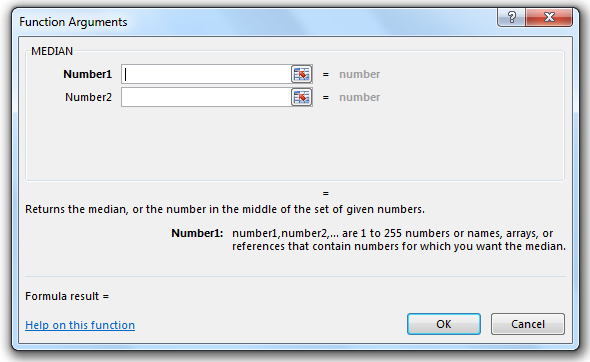 In current versions of Excel (Excel 2007 and later), the function can only accept up to 30 number argument but you can provide up to 255 number arguments to the Mode function in Excel 2003. 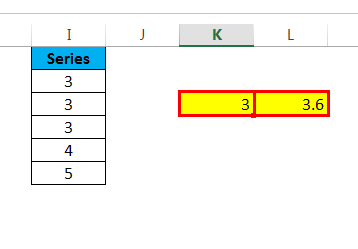 Cells with zero values (0) are added in calculations.